We know Crete better than anyone else and we will take you to places only we can. We are off-road experience in Crete for 36 years. Enjoy exciting, unforgettable, safe off-road driving at unexplored routes of Cretan mountains. 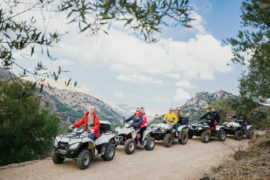 Explore the unknown parts of Crete with our ATV quad safari tour for real off-road adventures!! The first and best-rated quad safari tour in Crete…80% offroad experience. The tracks are fun and challenging, but our new and well preserved ATV quad bikes are easy to use and will make your tour the most enjoyable day of your holidays. Our professional guide will give you instructions the whole time of the safari, and the lunch in the mountain taverna is an excellent break in the day. Except for our popular ATV Quad safari tour, GoXplore offers a big variety of Crete excursions for you, your family and friends. Trips from Crete to Santorini, Knossos Palace, Spinalonga island tours and many more landmarks and museum excursions. Things to do on the island for the whole family, including kids activities and water parks. Enjoy a day in paradise by visiting Cretan beaches such as Elafonisi Island with its pink sand and crystal clear waters as well as Chrissi island on the most southern part of Europe. We do not miss extreme activities so that you can find Jeep Safari, mountain bike tours, and hiking excursions. Our office and web tour guides will help you find and pick the best excursions and things to do in Crete. Big variety of tours in Crete. Free hotel transfer on a variety of excursions. Wir waren heute zu Zweit mit Andreas unterwegs. Super Tour, super netter Guide, super Quads. Wir sahen tolle Landschaften und schnuckelige kleine Dörfer mit wahnsinnig netten Bewohnern incl. sehr leckerem landestypischen Mittagessen in einer kleinen Taverne. Am coolsten sind wohl die Tempo-Strecken über Teer und die langsamen offroad-Passagen, bei denen man z.T. wirklich überlegen muss, wie man woher fährt.... ...alles aufgezeichnet auf der GoPro. Herzlichen Dank auch dafür. Wir sind wirklich begeistert und würden den Trip sofort wieder buchen. 5,5 / 5 Punkten.